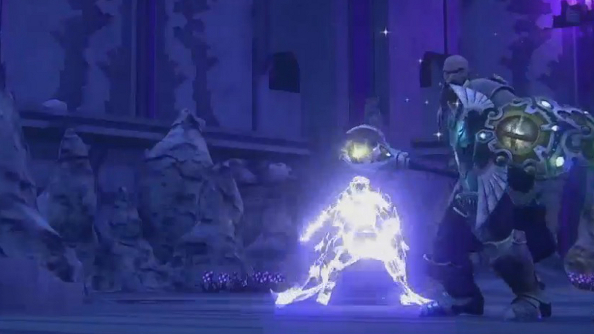 SOE’s EverQuest Next presentation was impressive. David Georgeson took to the stage to tell the story of a single character, from character creation to becoming a multi-classed hero in the middle of a gargantuan siege battle. Along the way, a slew of classes and genuinely fascinating features were spilled, making EQ Next continue to be a very tempting prospect. 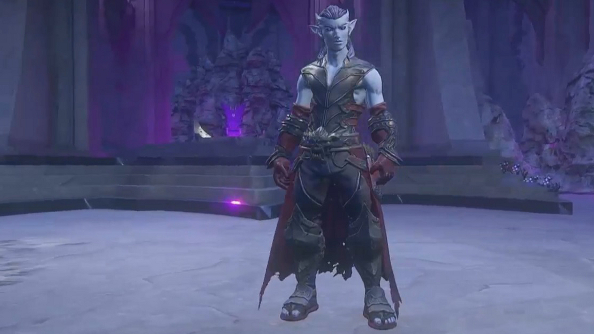 And the environments – the stage that these new things were being shown off on – was a Dark Elf city created by both players and devs. The Dark Elf race has been a focus for SOE lately, with the studio giving the community design documents so they could build their own environments, potentially getting their work in the game. The race itself was shown off today, both male and female character models. Four of EverQuest’s classes got their time in the sun. It was quickly clear that crowd control and manipulating the environment played a role in each class. The wizard can slam spells into enemies, lift them up into the air and smash them into the ground – creating craters – or just root them in place. Warriors dominate battlefields with massive whirling attacks and flashy abilities that light up the screen. On their own, they seem devastating, but SOE is creating a lot of synergies between classes. There’s the elementalist, for instance. This caster can freeze the ground, creating a trap that, when enemies walk across it, can have another spell flung at it to freeze them in place, making them easy fodder for a warrior. And now that the ground is brittle, the warrior can start hammering at that, too, opening up caves below. 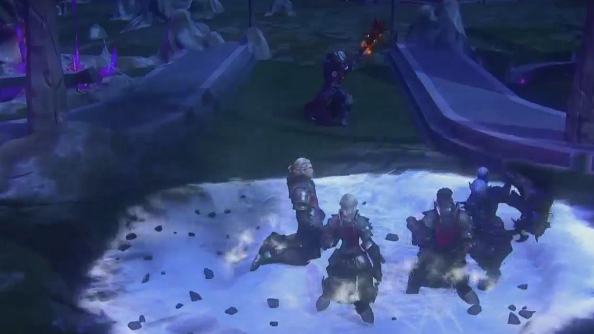 The cleric emphasises that support classes in EQ Next won’t be forced into staying out of the fray. It charges into battle, encased in armour, wielding mace and shield. It lays down some hurt on enemies, while buffing allies. And there are some handy abilities when an ally buggers off ahead, and gets into trouble. Intercession hurtles the cleric into the battle, dealing damage to enemies while rejuvenating the armour of chums. It’s the tempest that struck a chord with me the most, though. Attacking with lightning as well as weapons, the tempest on display floated down towards enemies, gliding as they focused their attacks elsewhere. When she reached them, she transformed into lightning and dashed around the battlefield, carving everyone up. The class is built around heroic movement, engaging quickly, dodging and escaping when necessary. All of the classes were presented as things that could be unlocked through an adventure. The Dark Elf unlocked the cleric class after rescuing an old man and travelling with him on many adventures. The tempest class was unlocked during a rallying call – a big story arc with a knock on effect – where the player discovers a clandestine organisation of lightning wielders. With these rallying calls, “you can quite literally change the world,” said Georgeson. Completing a rallying call has a tangible impact on the world. In this case, helping out in the Dark Elf city makes a group of bandits extremely jealous. Oh bandits, always so envious. These bandits get it in their minds to lay siege to the city, kicking off a titanic battle with big siege engines and walls covered in archers. 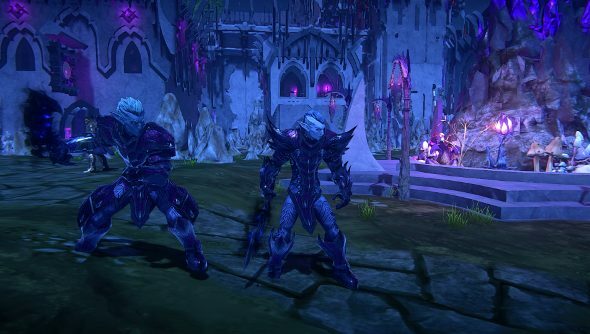 There’s a lot going on in EverQuest Next. And I reckon it’s worth getting excited about.